Drill guide preparation with the aid of a temporary; Bone augmentation using a bone block graft; Implant insertion; Augmentation of gingival margin with a soft tissue graft from the roof of the mouth; Preparation of tooth replacements according to esthetic criteria, in some cases, as all-ceramic crowns. Objectives: Ridge preservation protocols using BioOss Collagen after tooth extraction have successful outcomes, but previous studies included only fresh extraction sockets and omitted infected sites with chronic pathology. The effectiveness of collagen membranes is also controversial. 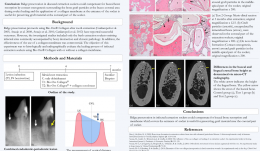 The aim of this study was to histologically and radiographically evaluate the healing process of infected extraction sockets using BioOss[tm] Collagen with or without collagen membrane. Methods: Six adult Beagle dogs aged 1–2 years, and approximate weight 10 kg, were used. Sulcular incisions were made, and a flap was elevated in the mandibular premolar area. The left third mandibular premolar and both fourth mandibular premolars were hemisected with fissure burs, and the distal roots were removed atraumatically. A #2 carbide round bur was used to dig a notch in the mesial side of the mesial root, and the notch was filled with a collagen sponge soaked in Porphyromonas gingivalis. The pulp of the mesial roots was removed with a K-file before injection of P. gingivalis and sealed with intermediate restorative materials before suturing the flap. Following communication of the two pathologies (after about 4 months), the mesial roots were extracted and the defects were randomly assigned to one of three subgroups using a 3 x 3 Latin square design. These were no treatment (controls); BioOss Collagen graft (group T1); and BioOss Collagen graft with BioGide collagen membrane (group T2). After 7 months from induction of the lesion (baseline), the dogs were sacrificed and block biopsies were placed in a fixative, dehydrated and embedded. The percentage of different tissues (mineralised bone, bone marrow and biomaterial) in the infected extraction sockets was evaluated, and each extraction site specimen underwent the micro-CT examination. Results: Micro-CT revealed differences in height between the buccal and lingual crests, in addition to the bone morphometric parameters. There were significant differences in the vertical distance between buccal and lingual crests in controls (2.22 mm ± 0.26) and T2 (1.80 mm ± 0.16. Bone surface density (BS/BV) values were 0.32 ± 0.05 (controls), 0.45 ± 0.13 (T1) and 0.50 ± 0.03 (T2). There was a signiﬁcant difference between BS/BV values in controls and T2. The level of interconnectivity of the bone (TbPf) gave values of –0.53 ± 0.24 (controls), –0.44 ± 0.11 (T1) and –0.32 ± 0.15 (T2). Values for structural model index (SMI) were –5.34 ± 3.07 (controls), –2.94 ± 2.38 (T1) and –1.27 ± 0.83 (T2). TbPf appeared to increase gradually from controls to T1 then T2. The sockets in the control group were occupied by mineralised bone (68.08% ± 6.51) and bone marrow (30.56% ± 6.07%); in T1 they were filled by mineralised bone (55.90% ± 4.70%), bone marrow (23.50% ± 4.19%) and BioOss[tm] particles (18.49% ± 2.11%), and T2 contained mineralised bone (61.38 ± 6.9%), bone marrow (10.31% ± 4.93%) and BioOss[tm] particles (27.04% ± 5.25%). The T2 sockets contained more bone graft material than those in T1. There was a signiﬁcant difference between amount of mineralised bone in controls and T1. Conclusion: In the micro-CT analysis, the vertical distance between the lingual and buccal crests was significantly shorter in the T2 group (ridge preservation with BioOss Collagen and collagen membrane) compared to controls. This is in line with a previous study that reported similar results using BioOss Collagen for ridge preservation, indicating a possible role of the biomaterial in promoting de novo bone formation to maintain the ridge profile and compensate for marginal ridge resorption. 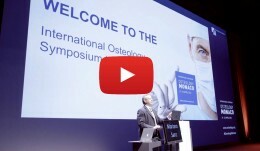 The use of a membrane for ridge preservation (as in T2) to prevent loss of the graft material in the initial healing phase may have improved contact osteogenesis near the coronal part of the buccal bone. Ridge preservation in infected extraction sockets may compensate for buccal bone resorption, and using membrane to cover the entrance of sockets may help preserve graft material near the coronal part of the socket. List of materials: Periodontometer, handle #6 (Hu-Friedy); Universal probe, handle #6 (Hu-Friedy); Mirror handle #6 (Hu-Friedy); Transfer handle, round; Respiratory, Hirschfeld; Surgical curettes, Prichard; Universal curettes, Younger-Good, handle #6; Universal curette, Indiana University, handle #6; Universal curette, Langer After-Five, handle #6; Tweezers, Gerald; Tweezers, fine; Spatula, fine; Tissue cutter, Super-Cut; Thread cutter, Godman-Fox; Needle holder, Lichtenberg; Needle holder, Castroviejo; Hemostat; Scalpel blades; Tunneling instruments; Gingivectomy meter, Orban, handle #6; Blade holder, Universal 360°; Suture material, polypropylene C6; Suture material, polypropylene C17.